Sauna thermometer measures sauna temperature from 0°to 140°C. 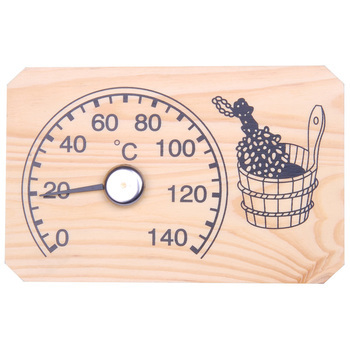 The bucket and birch leaf design, on this pine thermometer, sets the tone for your next sauna experience. Installation Tip: Hang on small nail or screw on wall in neutral area, at least 3 feet away from door and heater, 1 foot down from ceiling for accurate reading of sauna temperature.